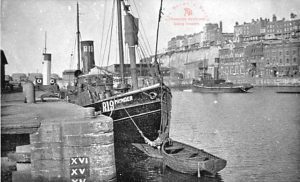 15.6.1893: Launched by Mrs W. H. Dodds, wife of owner at Marr Bros, Leith (Yd.No.41) as a liner for William Hall Dodds, Aberdeen as EBENEZER. 30.8.1893: Registered at Aberdeen (A715). William Hall Dodds designated managing owner. Fishing out of Aberdeen as a liner (Sk.W. Buthlay). 9.1897: Sold to John Edward Rushworth, Grimsby. 10.9.1897: Registered at Grimsby (GY417). John Edward Rushworth designated manager. 5.1899: Sold to Hamilton Dixon, Whitehaven. 8.5.1899: Grimsby Registry closed. Registered at Whitehaven (3/1899) (WA80). Hamilton Dixon designated managing owner. 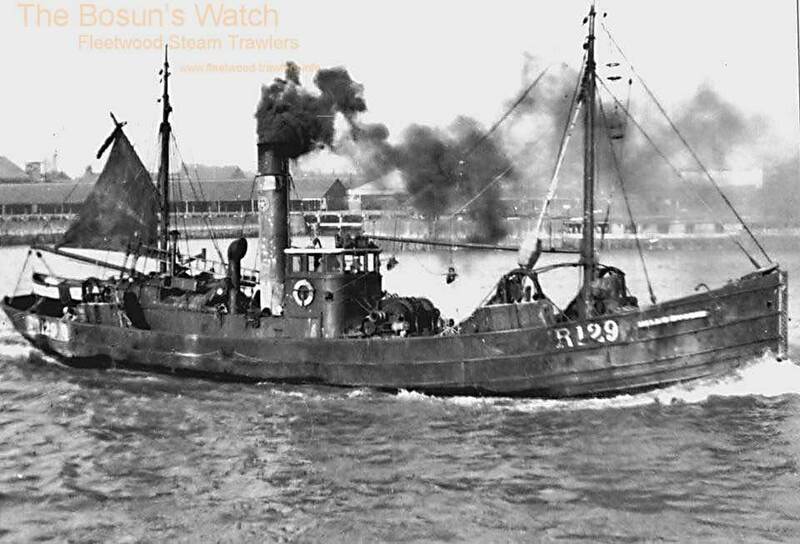 This entry was posted in Non Fleetwood Vessels, Seasonal Visitors, Steam Trawlers on December 24, 2018 by Fred Smith. 1890: Launched by Earles Shipbuilding & Engineering Co Ltd, Hull (Yd.No.332) for The Grimsby Steam Fishing Co Ltd (64/64), Grimsby as ELECTRIC. 2.1890: Completed as a well vessel and liner. 25.2.1890: Registered at Grimsby (GY236). Henry Kelly, Cleethorpes appointed manager. 1912: George Edward James Moody, Cleethorpes appointed manager. Fishing out of Fleetwood. Engaged in trawling. 1.1.1914: Tonnage altered to 78.73 net under provision of Merchant Shipping Act 1907. 29.5.1915: Requisitioned for Fishery Reserve. 7.1915: Sold to Aberdeen owners. 5.1916: Sold to Neville Simpson Clarke, Scarborough & Thomas Crimlisk, Filey. 10.5.1916: Registered at Scarborough (SH232). 5.1916: Thomas Crimlisk designated managing owner. 29.11.1916: Sold to Thomas Crimlisk, Filey; Frank Crimlis, Hull; Frederick William Simpson and Benjamin Simpson Jnr, both Scarborough. 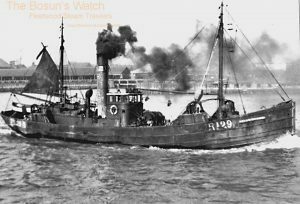 19.4.1917: Fishing out of Hull. 4.1919: Sold to Reginald White, Grimsby. 25.4.1919: Registered at Grimsby (GY286). Reginald White designated managing owner. 1926: Sold to Charles Harold Bird, Hakin. 1928: Sold to Charles A. Munnings, T. D. Davies, R. A. G. Taylor & Archie R. Locke, all Hakin. David Pettit appointed manager. 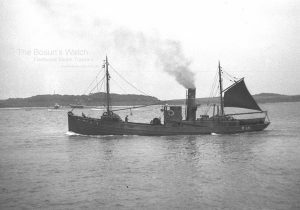 03.11.1928: Trawling off the Co. Wexford coast (Sk. “Ginger” Knowles); eleven crew all told. 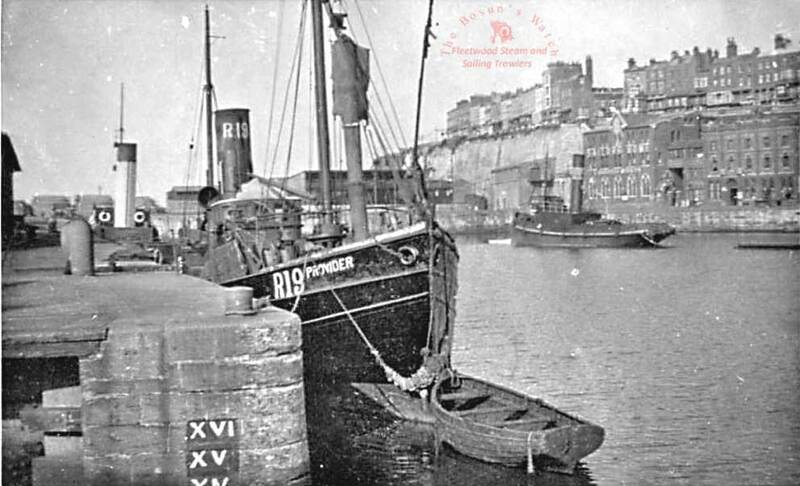 In company with steam trawlers UBERTY (R219) (Sk William George Stanford) and CICERO (H931) (Sk. Noel Bray). Towing around the Black Rock inside the Barrels Rocks, gear fouled propeller and vessel became unmanageable, struck a rock and started to fill. Crew taken off by UBERTY (R219). At about 11.00pm foundering in deep water off Carnsore Point. 5.11.1928: Survivors landed at Milford. 15.11.1928: Grimsby registry closed “Total loss”. This entry was posted in Lost Vessels, Non Fleetwood Vessels, Steam Trawlers on October 3, 2016 by Fred Smith.